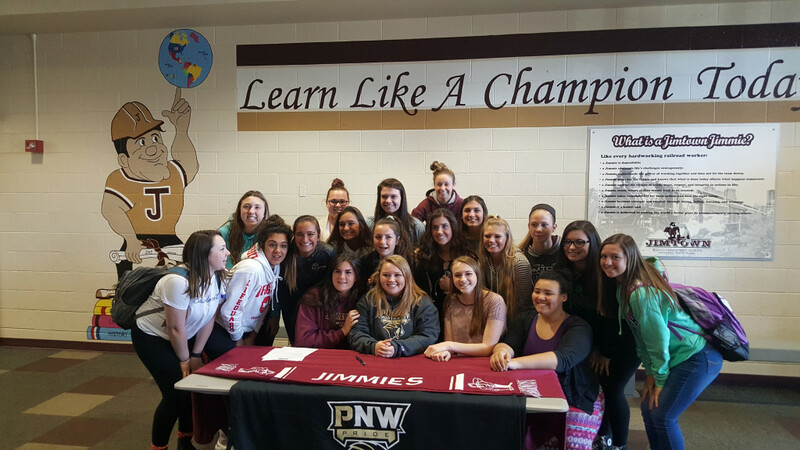 Mikayla Garner has been a 4 year softball player at Jimtown and been a regular starter on the team since her sophomore year. 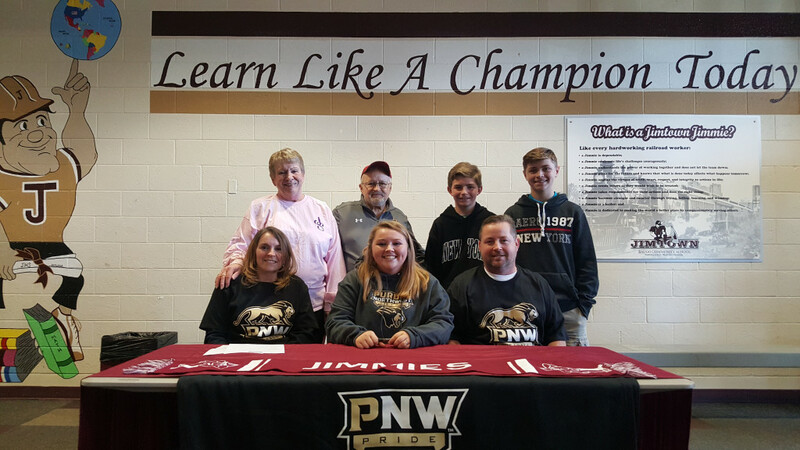 The big-hitting 3rd baseman for the Lady Jimmies has been one of the leaders on the team in hitting and specifically home run hitting for the last couple of years. Mikayla has not been just a home run hitter she has had an excellent overall hitting percentage and is excellent defensively on the hot corner. Mikayla is currently one of the 6 seniors on Jimtown’s undefeated softball team. While the season is still very young, the Lady Jimmies who are coached by Brandy Eberhart, are gunning for a championship in the NIC South and a sectional championship. If that happens, you can be sure that Mikayla Garner will be a big part of our success. 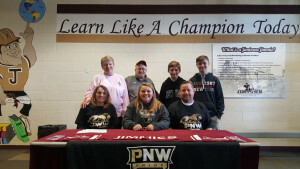 Mikayla will be attending Purdue University Northwest in Hammond, Indiana—“The PNW Pride” are an NCAA Division 2 program. They are part of the Chicagoland Collegiate Athletic Conference. 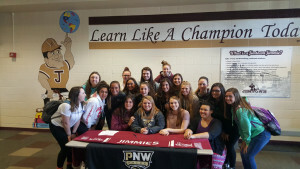 Great luck to Mikayla in her collegiate softball career!! Also on Wednesday the 12th, we had the honor of hosting a ceremony for Brandon Burkhart to sign his offer to continue his athletic and academic career at Concordia University in Ann Arbor, Michigan. 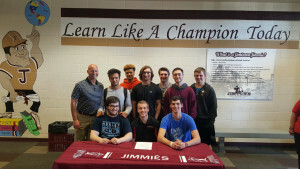 Brandon has been a 4 year player on the Jimtown Football Team and also the Jimtown Track Team. Brandon’s offer to play at Concordia will be for football. Brandon has also been a standout track runner for Jimtown over the past 4 years. 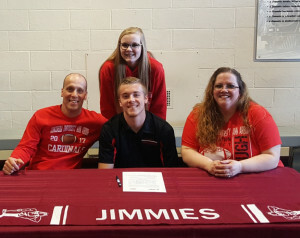 He has been an integral part of various sprint and sprint relay events for the Jimmies. Next Fall, Brandon will play for the Concordia University Cardinals. Concordia participates in football and other sports in the NAIA. The Cardinals participate in the WHAC (Wolverine-Hoosier Athletic Conference). The Cardinals are certainly going to get a great kid in Brandon Burkhart. He cares. He loves his school and community and is an athlete that will do whatever is asked of him and whatever it takes to be successful. GOOD LUCK BRANDON!! 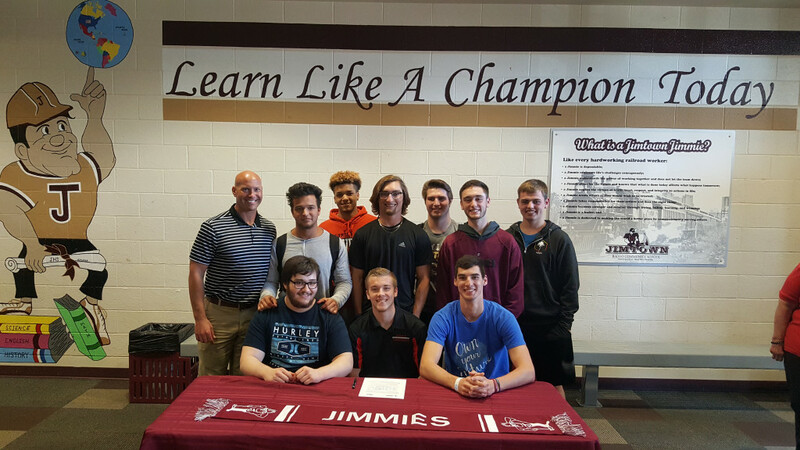 ONCE A JIMMIE…ALWAYS A JIMMIE! !